What can ancient rocks tell us about the future of our planet? 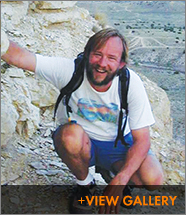 For 20 years, Brad Sageman and his students have climbed mountains in search of evidence for the causal factors for ancient warm climates. He has probed the sedimentary layers of the great Cretaceous greenhouse, a time of exceptional global warming in Earth history. He has dug for rocks, labeled them, put them in his backpack and lugged them down the mountains. And he has the battered knees to show for it. He has also studied rocks from the ocean floor that contain evidence of ancient ocean anoxic events, which at one point caused widespread extinction of marine organisms. Sageman says the evidence in the rocks has much to tell us about today’s warming planet. Do we have reason to be worried about global warming? “Worried” evokes the idea of people trying to stir up the public about an issue. As a scientist considering this problem, do I think that it is our absolute responsibility to understand as much about the climate system as possible so we can better predict the impact of greenhouse gas emissions? Absolutely. Do I think we’re facing warming in the future? With absolute certainty, the planet is going to get warmer. How much and how soon, we can’t be sure yet. So we need to inform people about this issue. Unfortunately, there is a lot of misinformation out there. Hasn’t the planet gone through warming and cooling cycles throughout geologic history? Absolutely. What we are still uncertain about are the rates of change and the “tipping points”—instabilities in the climate system that could lead to very rapid and unexpected changes. We know from studying past climate events that there can be some enormous and rapid changes in the climate system. How might the effects of global warming play out? One of the consequences of global warming is rising sea levels. Rates of glacial melting, in both Greenland and Antarctic ice sheets, as well as mountain glaciers, are rapidly accelerating. When that melt water goes into the ocean, the sea level rises. The rate at which this happens seems slow relative to an event like a tsunami, and therefore might appear to pose little threat. But in areas like Antarctica, large masses of ice could cut loose quickly, melt rapidly, and cause a rapid increase in sea level. The rates of rise would not cause catastrophic, immediate loss of life for people in, say, Manhattan. It might take a year or a few years to flood the lowest elevations of Manhattan and people would be able to adapt. But now think about the number of really poor folks who live in coastal areas like Bangladesh or Burma, who are already severely impacted by major storms. With a sea level rise, the number of climate-related deaths and displaced refugees will increase significantly. I’m not saying the world will end. My greatest concern—the worst case scenario—is that rapid changes in the Earth’s climate system could ultimately destabilize political entities, foment massive economic and political strife, and lead to major military conflicts in many parts of the world. Is change coming no matter what we do? Barring a major technological advance, I believe we’re in for the ride. Carbon dioxide (CO2) has a long residence time in the atmosphere, up to several centuries or more. As a result, the CO2 we have produced from industrial and agricultural practices up to today could take as many as 200 years to decrease from present levels, were we to suddenly stop those human activities. And even if it does decrease, it will most likely equilibrate at a new level that is higher than the pre-industrial level. Furthermore, CO2-producing activities are more likely to increase than reverse during this century, as was concluded recently by the Intergovernmental Panel on Climate Change. It is very difficult, given all that we know about the climate system, to conclude anything else—we’re living on a warming planet. I often jokingly advise people to buy that vacation property at high latitudes away from the coasts, in places like the Alberta foothills, and this is only partly in jest. Why wouldn’t CO2 in the atmosphere decrease if we stopped emitting it? Tell us about climate research in your department. Earth scientists all over the world are engaged in studies of paleoclimate records in an effort to better understand the behavior of the Earth’s climate system. Major perturbations in climate have occurred many times in Earth history and careful analysis of these events forms the basis of our present knowledge of the Ice Ages, as well as of greenhouse episodes of the past. It is studies such as these that will improve our ability to predict future climate trends. About half of the faculty in my department work on “deep time” climate reconstructions and the biogeochemical cycles of elements such as carbon, sulfur, nitrogen and phosphorus that control climate. The other half are geophysicists who work to understand internal Earth processes that control such factors as mountain uplift and volcanism, which are also crucial to a comprehensive understanding of the climate system. Some of our researchers are investigating massive glacial events that occurred in the late Precambrian, about 700 million years ago. Others are studying extremely rapid warming that took place in the early Tertiary, about 55 million years ago. My research focuses on the mid-Cretaceous Period, about 100 million years ago, which was a time of high atmospheric CO2 levels, little or no polar ice caps, flooded continents, and very warm surface temperatures. How does your work relate to today’s climate? Ocean anoxic events, which reached their peak in the Cretaceous Period, represent times when the burial rate of organic carbon into marine sediments increased dramatically. An important driving force for this was increased primary productivity in ocean surface waters, most likely caused by higher nutrient levels in the oceans. It appears that volcanism may have led to increases in atmospheric CO2 levels, which in turn led to warmer temperatures, higher rates of chemical weathering, and greater release of nutrients from the land surface to the oceans. An interesting aspect of the ocean anoxic events is that they appear, in some cases, to have buried sufficiently large masses of organic carbon in sediments to draw down atmospheric CO2—a kind of negative feedback effect. My students and I direct a large part of our research at constraining the time scales over which these changes occurred. Since the worst case scenarios suggest that CO2 could reach levels similar to those of the Late Cretaceous by the next century, detailed study of ocean anoxic events should provide us with a better understanding of what could happen and how long it might last. How do the rocks themselves reveal these things? We use various measurements of rock properties and chemical composition to reconstruct the physical, chemical, and biological parameters at the time the rocks were deposited. When these measurements are taken at closely-spaced intervals through a section of rock that records a major event in Earth history we can study changes in selected parameters to understand how environmental processes were varying. “Physical parameters” refer to the sedimentary structures in the rocks themselves, observed on outcrops and in cores. Each different layer of rock is quantified in terms of thickness, grain size, grain composition, etc. These measurements can be compared to similar features seen on the ocean floor today and allow us to reconstruct water depths, current directions, waves and tides, storm frequency and intensity, etc., so when compiled over a time span of thousands to millions of years, they provide a measure of climate changes. “Chemical parameters” are the many proxy measurements we make after taking samples of the rocks, crushing them to powder and then applying a very broad array of chemical techniques that allow us to quantify elemental concentrations, as well as changes in the abundance of different stable isotopes of selected elements (like C, N, S, O, and H). Stable isotopes are different from radiogenic isotopes, which are the ones that decay through time. It is the radiogenic isotopes that give us a means to measure the geologic age of a sample. “Biological parameters” refer to fossils and traces of biological activity recorded in sediments (burrows, etc.). Trends in these measurements also record factors like changes in levels of water column oxygenation, which fall during ocean anoxic events. All these parameters are measured independently and simultaneously. Our reconstructions of the past thus represent multi-proxy analyses in which complementary lines of evidence are used to make interpretations. This process is very time consuming but necessary. After all, we are like forensic scientists trying to reconstruct a crime scene that has suffered millions of years of deterioration. What’s new and exciting in your study of rocks? One of my most recent projects is a collaboration with Irish scientist Professor Jennifer McElwain. She has developed a method for detection of ancient atmospheric CO2 levels (chemical parameter) using the ratio of stomatal cells to surrounding epidermal cells in fossil leaves (biological parameter). Such patterns can be observed on waxy cuticle material using a special microscope. Fortunately, cuticle is very resistant to deterioration over geologic time scales and when separated from ancient rock and identified, it can be used to reconstruct CO2 levels across time intervals of interest, like ocean anoxic events. When Jenny and I realized the potential of her method for the Cretaceous anoxic events I was studying, we recruited a graduate student for the job. Rich Barclay, whose prior training is in the field of paleobotany (the study of ancient plants), has been reconstructing CO2 using fossil leaves across that 100 million year old event I mentioned earlier. Recently he returned from Ireland, where, working with Jenny, he completed the first high resolution CO2 curve for this time interval. It shows that leading up to the event, CO2 is increasing and then it wiggles and drops. The increase in CO2 is really interesting because it provides evidence suggesting that warming initiated the ocean anoxic event. And this is the really important part in terms of implications for the future—if our planet continues to warm, will the oceans become more productive, leading to oxygen depletion in deeper waters? On what time scale might this happen and how will it affect the ecology of the oceans? How did you choose this field? Two of the most important pioneers in the field, [the late] Sy Schlanger, a Northwestern geologist, and Michael Arthur, a Penn State geoscientist, published a number of influential papers together in the 1980s. The Ocean Drilling Program was well underway, and Sy and Mike were among the scientists studying rocks pulled up in cores from the ocean floor. Two key observations that stemmed from their work on the Cretaceous segments of the cores were that highly organic-carbon rich rocks were preserved in certain horizons (meters to tens of meters thick) at sites representing a very broad range of paleodepths, and that these horizons contained very distinctive geochemical signatures indicative of a major change in the Earth’s carbon cycle. As more and more sites were discovered and correlated to a narrow window of time it became clear that some of these carbon burial episodes were global in scale. My dissertation research focused on the paleoecology of a Cretaceous rock formation in Colorado that also happened to be very rich in organic carbon. It was through my thesis adviser at the University of Colorado, Erle Kauffman, that I met Mike Arthur, who later offered me a post doctoral position at Penn State. Mike opened my eyes to the power of geochemistry and the significance of ocean anoxic events. The bulk of my career has been devoted to expanding the field that he and Sy Schlanger started in the ’80s. It is an interesting twist of fate that I ended up at Northwestern, essentially continuing the work that Sy Schlanger started here many years ago. What can you say with certainty about what you’re learning? When the climate on Earth warms, there are some consistent and predictable changes in the system, like acidification of the oceans. For example, my colleague [Assistant professor] Francesca Smith’s research focuses on the Paleocene-Eocene Thermal Maximum (PETM), 55-56 million years ago, which was the most recent episode in Earth history characterized by transient high CO2 levels and warm temperatures, similar to what we may experience as a consequence of anthropogenic CO2 production. During this event, acidification of the oceans is very well documented. When CO2 levels in the atmosphere rise, excess CO2 dissolves in the ocean. Combining with water, the CO2 makes carbonic acid. Acidic conditions cause organisms with shells made of calcium carbonate (CaCO3) to start dissolving, like a TUMS tablet in a glass of water. The evidence shows that this happened during the PETM; calcareous shelled marine creatures started dissolving due to the massive influx of CO2 to the system. This same process is beginning to degrade reef corals today. The skeletons of the corals are made of the same material, calcium carbonate. Bear in mind that acidification of the oceans during the PETM was a process that played out over hundreds of years. What we can’t be sure of yet is how soon in the onset of such a process would we begin to experience significant impacts in marine systems. Looking forward, what about solutions? The CO2 scrubbing technology isn’t what is stopping us. It’s common on submarines, for example. To answer the question about whether we can make it happen on a large enough scale, think back to what we did in World War II. The entire country mobilized. If global warming were Hitler, wouldn’t we be mobilizing our scientists, our labs, and our construction industry to change the paradigm and fix the problem? World War II was a costly endeavor for the country, but it was also hugely profitable for many American companies. Clearly those corporations grew into the so-called military industrial complex, which was fueled by the Cold War, and over the decades of the late 20th century provided a huge number of jobs and stimulated the economy. So now it’s the Warm War as opposed to the Cold War—the only difference is the perception of a threat. Like CO2, sulfur dioxide was a big pollution problem from coal-burning power plants. Then a way was developed to scrub the sulfur dioxide from the combustion exhaust by passing it through a system that mixes the SO2-rich gas with calcium carbonate crushed up from limestone. The product is calcium sulfate, or gypsum, which is what wallboard is made of. So you can produce a construction material from power plant waste and sell it for profit. That’s a beautiful example of solving an environmental problem in a way that helps the economy rather than harms it. Who will be most affected by climate change, our children? I am 51 years old right now, so I suspect it is unlikely that I will witness massive climate changes, although I cannot be 100 percent certain of this. I made a figure for my classes that plots the main phase of adult life (let’s say ages 25 to 65) for humans of my children’s age (10-12) and for their children, assuming that each generation’s life history is similar. The figure shows that adult life for my grandchildren will extend into the last 25 years of this century. Although I cannot rule out that climate impacts will be felt well before this, I am almost certain that, barring a large scale technological fix, the combination of dwindling hydrocarbon resources and warming-related environmental perturbations will result in serious impacts during the late decades of this century. Even if alternative energy technologies have replaced the hydrocarbon economy, the legacy of the Carbon Age will be lasting, and this is true regardless of whether the march toward Cretaceous-scale warmth is gradual, or worse, chaotic and unstable. Those living at the end of this century will likely experience a world that is very different from the present. Can I guarantee that the worst case scenario will happen? No. Can I guarantee that the same scenario will not happen sooner than predicted? Also no. This is a consequence of the uncertainties in the climate system, as well as our current state of knowledge about that system. But I can say this—the scientific evidence from the rock record clearly shows that such rapid swings in climate are possible. And that means this is not a problem to be ignored. What do you see as your public role in this, a need to shake people up? I don’t believe you can appeal to any group with histrionics. You need to speak from a reasonable point of view, review alternative interpretations, and then clearly identify what is your opinion as opposed to what is scientific fact. I recently spoke to an architectural firm in downtown Chicago, which, like many of their colleagues these days, is becoming more and more committed to energy efficient construction—and unlike just a few years ago, I was preaching to the choir. I just read a New Yorker article about farmers on an island in Denmark who have managed to go completely carbon neutral, with windmills, solar panels, biofuel furnaces, etc. These things make me think we are at the beginning of a groundswell of change. But these are all grass roots efforts. It is going to take a major change in global leadership to succeed in the kinds of solutions envisioned by people like Broecker and Kunzig, and it is only this scale of solutions that have the potential to really slow down or reverse the rising CO2 levels in our atmosphere.